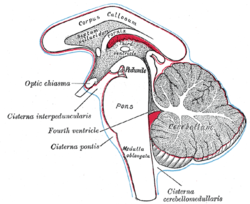 Cerebrum. Deep dissection. Inferior dissection. Pritchard, TE and Alloway, D. Medical neuroscience. Hayes Barton Press. 1999. ISBN 978-1-59377-200-0. Butler, AB and Hodos, W. Comparative vertebrate neuroanatomy: evolution and adaptation. Wiley-Blackwell. 2005. ISBN 978-0-471-21005-4.